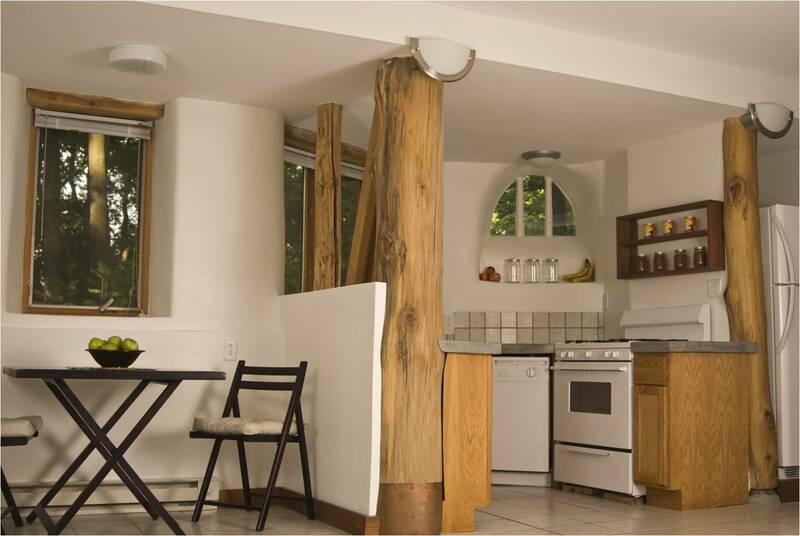 The straw bale house, built between 2001 and 2006, has a post and beam frame. The posts are tree trunks with bark peeled off and the beams and rafters are rough sawn wood. The plasters consist of a scratch coat of straw-clay and then lime-sand finish coats. Inside I used gypsum bucket mix with milk paint finishes in some rooms and regular latex in other areas. The layout is based on the traditional northern European three aisled hall house. It is a duplex–Karen and I live on the upper levels, and the lower level is rented out. The west wall is cob and the east and north walls are bale. I wanted to try a couple different building techniques. I put the cob to the west as the prevailing wind is from that direction. 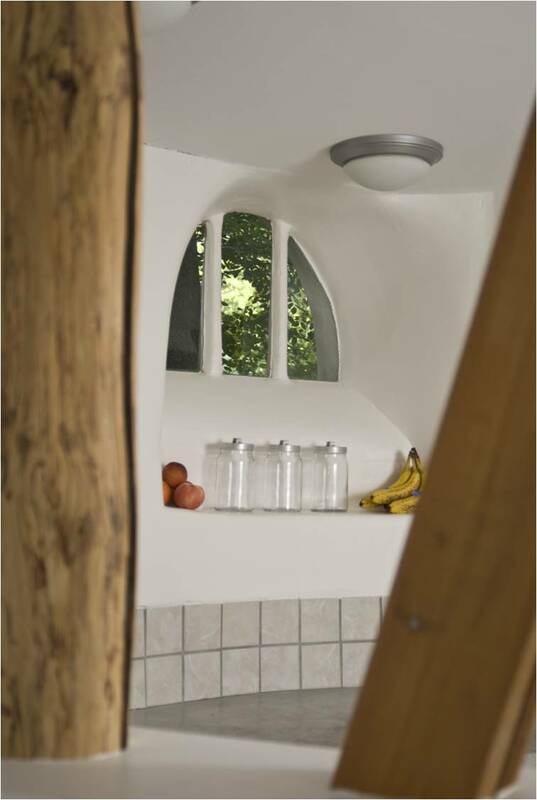 Cob would fare better against wind driven rain, however as the site is wooded, the wall stays dry. 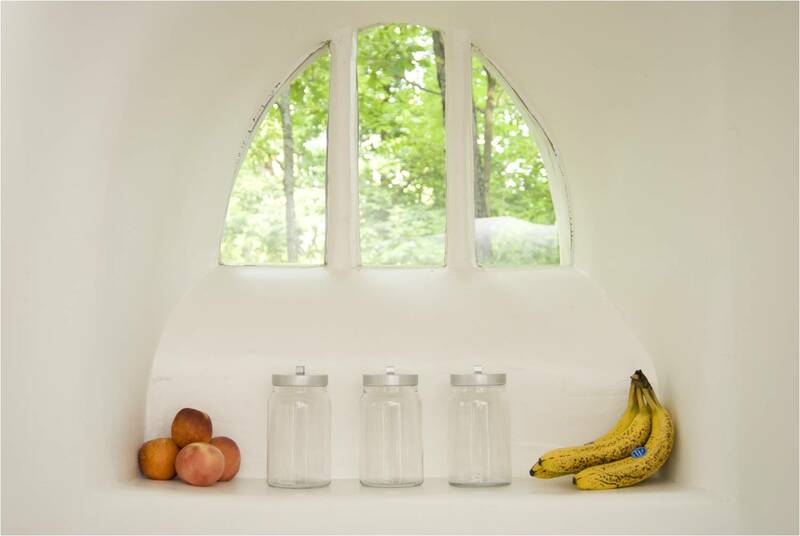 Cob can make beautiful, sculptural walls, however it is a poor insulator and I do not recommend it for our northern Indiana climate unless its recipe included a large percentage of an insulating aggregate such as perlite. 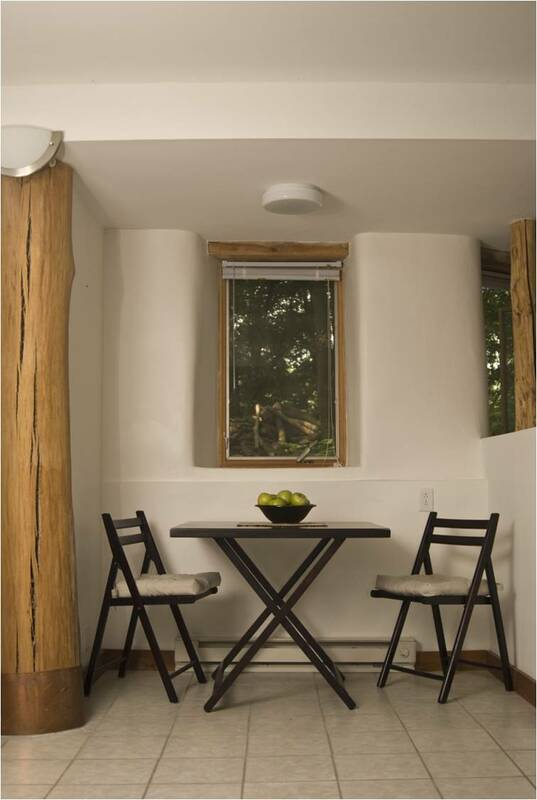 The above photos of straw bale house copyright Hilliard Photographics, LLC. The lower level of the house is a separate unit with 2 bedrooms and 1 bathroom. A building with 2 dwelling units under one roof is more cost and energy efficient than 2 freestanding buildings; in this case I also needed a rental unit to help defray the costs of developing the site and building the house. The lower level is fully underground on the north end, while to the south it is only 2.5 feet below grade. 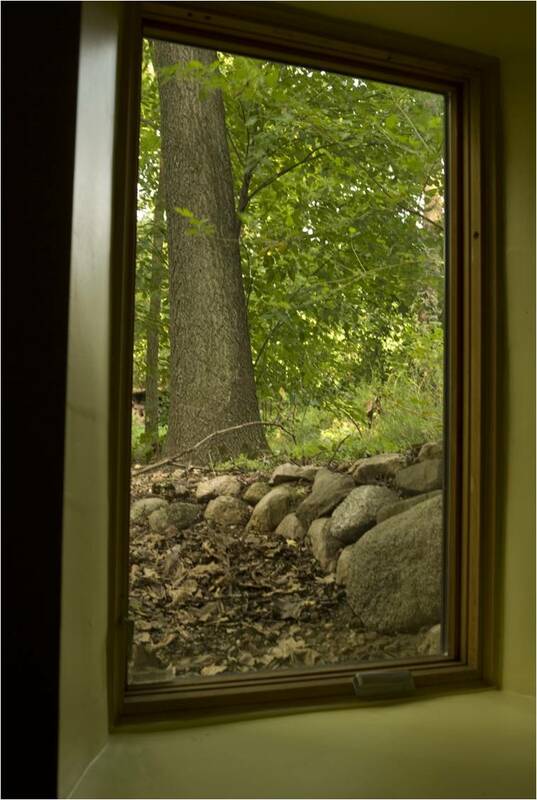 It has woodland views in 3 directions and lots of light along with an 8.5 foot high ceiling making it not feel like the typical basement apartment. 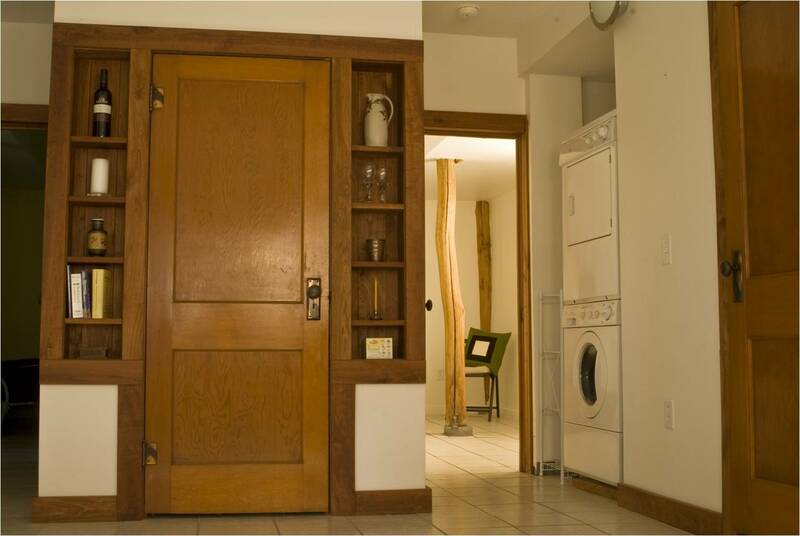 It has all appliances including dishwasher, and clothes washer and dryer. The lower level follows the same pattern of niches along the sides of the main room. and the trim in the main room is cherry. Thanks! The layout of this house is a 3-aisled hall house which is a traditional Northern European building form. Otherwise it is meant to look like cob and thatch houses traditional to Devon in southwest England. It was originally to have a thatch roof, but that did not work out so I went with Cedar shakes. One side wall is cob, the other straw bale, and the north gable end is straw bale. I would be happy to offer more info. Do you ever have open houses or tours? I’ve been looking at cob and or bale houses for awhile. We’re roughly 45 minutes to an hour northeast of you. I drove by numerous times while you were building it (used to live in middlebury). Thanks for all the pictures. Greg, This is an absolutely beautiful design. Are there plans that you worked from? Did you design it? I would love to get as many details as possible! The house is styled like the cob cottages in Devon, a county in England. The layout of the floorplan is a 3 aisled hall house. I extensively used the golden section proportion in designing the spaces, ceiling heights, window shapes, etc. My design was influenced by “A Pattern Language” by Christopher Alexander. I would recommend this book for anyone thinking of designing their own house. I’m planning to start construction of another straw bale house on my site in the spring of 2016. It will be similar in form and style to the first one. I’m hoping to avoid many of the costly mistakes I made the first time around, making it better crafted and more energy efficient as well.